~Nois is a Chicago-based saxophone quartet devoted to the creation and performance of new music. Founded in 2016 by graduate students at Northwestern University, ~Nois has quickly emerged as one of the premier young ensembles dedicated to contemporary performance. ~Nois has been a prize winner at major chamber music competitions including the Second Prize in the Open Division of the 2018 M-Prize International Chamber Arts Competition, the Silver Medal at the 2017 Fischoff National Chamber Music Competition, Second Prize at the 2018 North American Saxophone Alliance National Quartet Competition, and First Prize at the 2016 Chicago Woodwind Ensemble Competition. ~Nois strives to expand the possibilities of the saxophone quartet medium through close collaboration with today’s emerging compositional voices. ~Nois has premiered works by Mathew Arrellin, Niki Harlafti, Joe Krycia, Craig Davis Pinson, Alec Sloane, and Phil Taylor, and will collaborate with José Miguel Arellano, Julia Borrelli, Nicholas Cline, Darcy Copeland, and Gemma Peacocke, among others, during the 2017-2018 season. 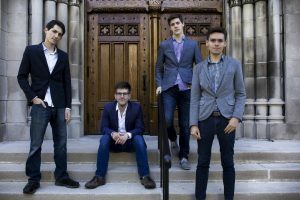 During the 2018-2019 season, ~Nois will be in residence at the University of Chicago where they will collaborate with current PhD students to workshop and premiere new works for the quartet. During the 2017-2018 concert season, ~Nois performed on the the Frequency Series at Constellation in Chicago, a weekly music series that features new and experimental music, where they presented the music of Chicago-based composers. In January 2018, ~Nois collaborated with conductor Chris Kaatz for a performance of Chen Yi’s saxophone quartet concerto, Ba Yin: The Eight Sounds. The quartet has also been featured on the Irving Park Fine Arts Music Series and the New Music Chicago Impromptu Festival. In March of 2018, ~Nois embarked on a five-week-long tour throughout the eastern United States with performances and master classes at Baldwin Wallace University, East Tennessee State University, James Maddison University, Lee University, Manhattan School of Music, Tennessee Technological University, and the Universities of Akron, Georgia, Maryland, South Carolina, and Tennessee. During the tour, the quartet performed with the Bang On A Can All-Stars for the U.S. premiere of Michael Gordon’s Big Space at the Big Ears Festival, a multi-genre music festival in Knoxville, TN. In July 2018, ~Nois will be a featured artist at the 5th annual Omaha Under the Radar Festival. The quartet has also been selected as fellows for the 2018 Eighth Blackbird Creative Lab where the ensemble will give the world premiere performance of Gemma Peacocke’s Dwalm. During the 2016-2017 season, ~Nois performed as a guest artist at Michigan State University, Oklahoma State University, the University of Arkansas, and the University of Missouri – Kansas City. The quartet was invited by Claire Chase, founder of the International Contemporary Ensemble, to perform the music of Pauline Oliveros with her on her guest artist recital at Northwestern University. In June of 2017, ~Nois partnered with Accompanietta to present Extravaganza!, a free concert for the community of Evanston, Illinois featuring the work of local musicians and composers. ~Nois also performed at the 2017 North American Saxophone Alliance’s Region V conference in Fort Wayne, Indiana.